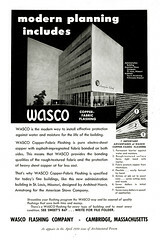 This advertisement for copper-fabric flashing featuring the Magic Chef Building was published in the April 1950 issue of Architectural Forum. Manufacturers and distributors of architectural products took advantage of the notoriety of particular buildings in the advertisements, particularly when their products were less than exciting visually. Modern design, technical innovation, and modernist aesthetics are combined for maximum impact.